I absolutely love the RN Estudio Blood Bowl miniatures (there are also non Blood Bowl figures as well! ), and this is another great example. This was painted during a few recent hangouts, and it was very fun. All of the miniatures from the team are very well sculpted and cast with excellent quality resin... minimal mould lines too! The purple to turquoise transition is also a favorite. With all the muscles sculpted into it, there were even more opportunities for those transitions. All of the details are very sharp, which is very handy! They are also very "compact" and sturdy for resin figures, which means they are reasonably viable to a rough and tumble game like Blood Bowl!! 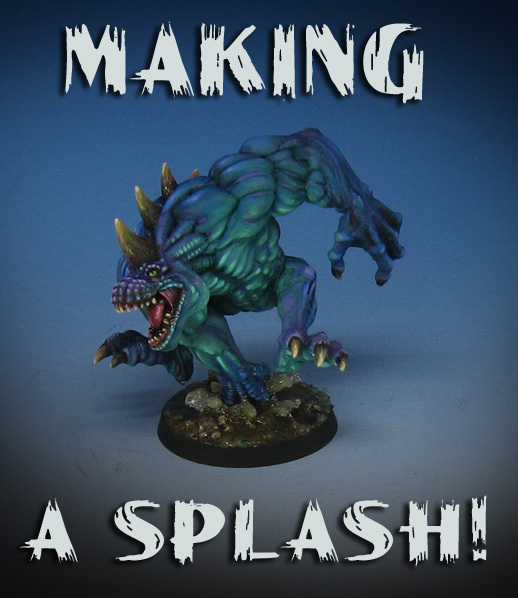 The water effects were quite simple, using the Liquitex Heavy Gloss Gel. It was built up in multiple layers, which allowed me to "extend" the splashes a bit more with each layer applied. I have done this on a number of figures, and on bases as waterfalls, etc.